Taco seasoning and similar spices flavor this hearty, beefy taco soup. 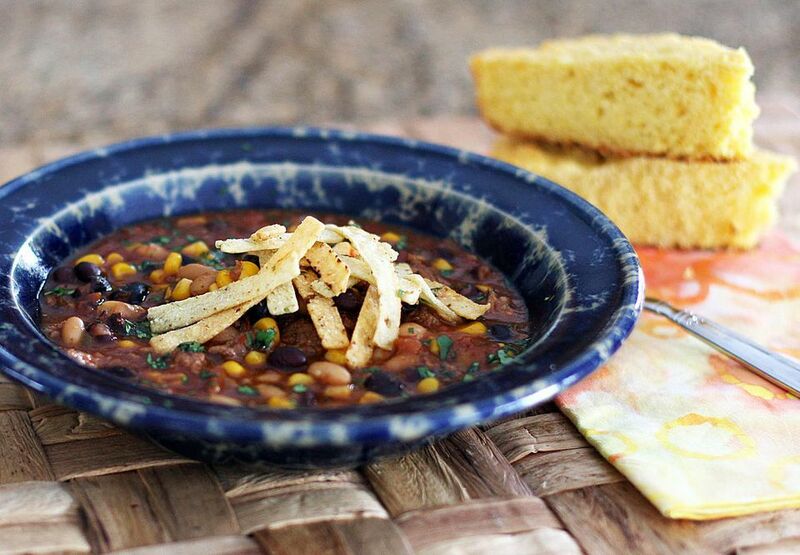 Top this delicious slow cooker soup with tortilla chips or strips, or garnish with shredded cheese or sour cream. In a large skillet, cook the ground beef with the onion and peppers, stirring frequently, until the beef is no longer pink. Transfer to the slow cooker insert (3 1/2- to 6-quart is fine). Add the two cans of beans, taco sauce or tomato sauce, diced tomatoes, taco seasoning, garlic powder, cumin, oregano and corn. Cover and cook on LOW for 6 to 8 hours, or on HIGH for 3 to 4 hours. Add salt and pepper, to taste. This taco soup is a spicy mixture of ingredients, cooked on the stovetop. Ranch dressing mix helps to flavor this tasty soup. This is a similar recipe for taco soup, made with kidney beans and Rotel tomatoes. Serve this cheeseburger soup as a hearty supper dish with biscuits and a salad, or serve a cup with half a sandwich for a satisfying lunch.